This is my 500th post. So, to commemorate the occasion, I wanted to write about something monumental. When it comes to funerary sculpture and architecture, nothing is more monumental than the pyramid. The Egyptians knew how to bury their dead, especially when it came to burying the pharaohs. After the French and British occupations of Egypt, there was a renewed interest in Egyptian architecture and symbolism. The Egyptian symbol that is most commonly found in American cemeteries is the obelisk. And the most famous obelisk in America is the Washington Monument in Washington, D.C. But the pyramid is by far the epitome of Egyptian funerary architecture, the tomb of the pharaohs. The oldest pyramid is the Pyramid of Djoser built over four thousand years ago from 2630 BC to 2612 BC. The largest of the Egyptian pyramids is the Pyramid of Khufu at Giza built between 2589 and 2566 BC. 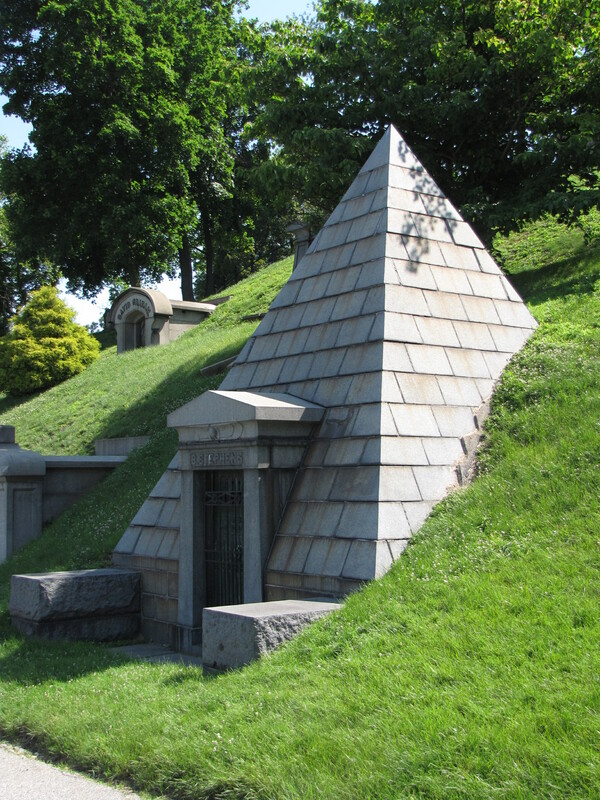 This later pyramid was the inspiration for many of the pyramids found in American cemeteries, three of which can be found in the Green-Wood Cemetery at Brooklyn, New York, which I will write briefly about today: The Van Ness-Parson Monument, the Henry Bergh Mausoleum, and the Benjamin Stephens pyramid mausoleum. 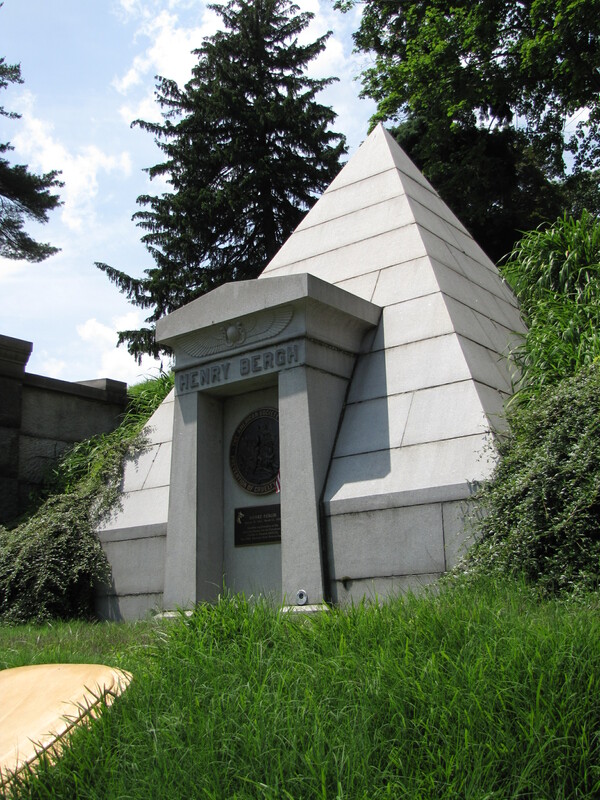 The pyramid mausoleum of Henry Bergh was built in 1888. It is an imposing structure. As far as mausoleums go, it is relatively unadorned except for the winged globe surrounded by two rearing snakes—the uroei—above the doorway. In this example, there are three sets of falcon wings that are a symbol of the king, the sun, and the sky. The globe represents the Egyptian god, Horus. The uroei, snakes, are waiting to strike. They symbolize the king’s ability to ward off evil spirits. On the entryway of the mausoleum is a large round bronze insignia of the ASPCA which displays a man lifting a club to beat an horse. An angel comes between the man and the horse interceding to stop the cruelty. The Stephens pyramid, built in 1890, is very much like the Bergh pyramid in that the only ornamentation is above the doorway. Again, the winged globe is carved onto the lintel. The Stephens pyramid, though, while having the same base width is taller. This pyramid was built in 1931 for Albert Parsons. It is broader than the Bergh and the Stephens pyramids and is adorned with Christian and Egyptian symbolism. 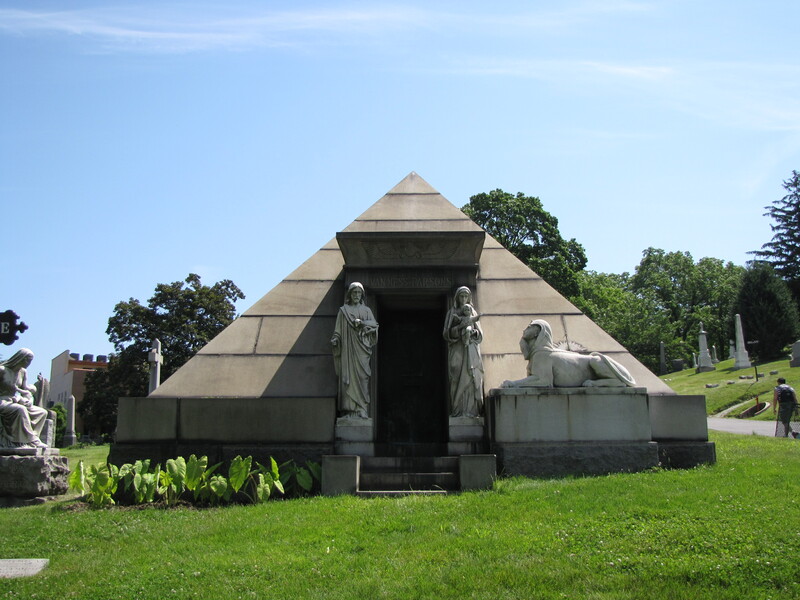 Note: For a more complete analysis of the Egyptian Revival architecture found in the Green-Wood Cemetery, check out Elizabeth Broman’s article, “Egyptian Revival Funerary Art”, Markers XVIII, 2001, pages 30-66. 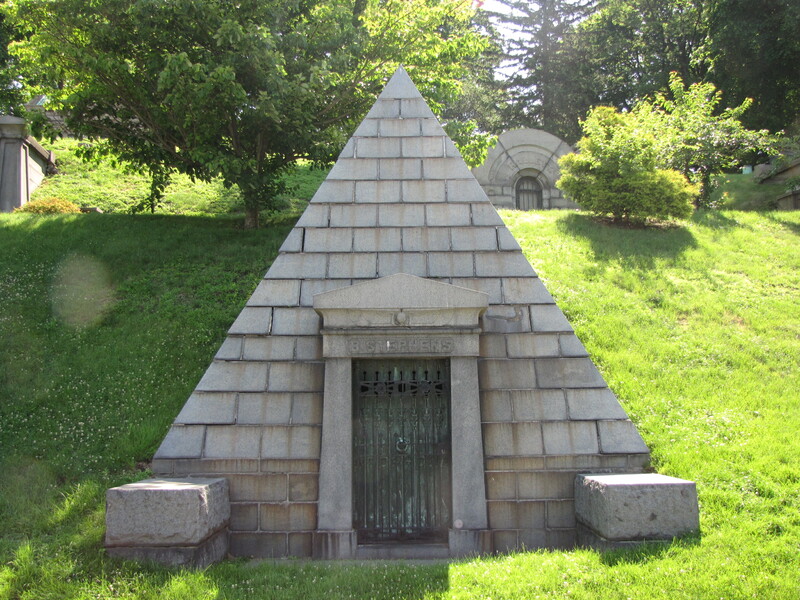 In her article she writes not only about the pyramids but other Egyptian Revival-style mausoleums found in Green-Wood. Happy 500th. 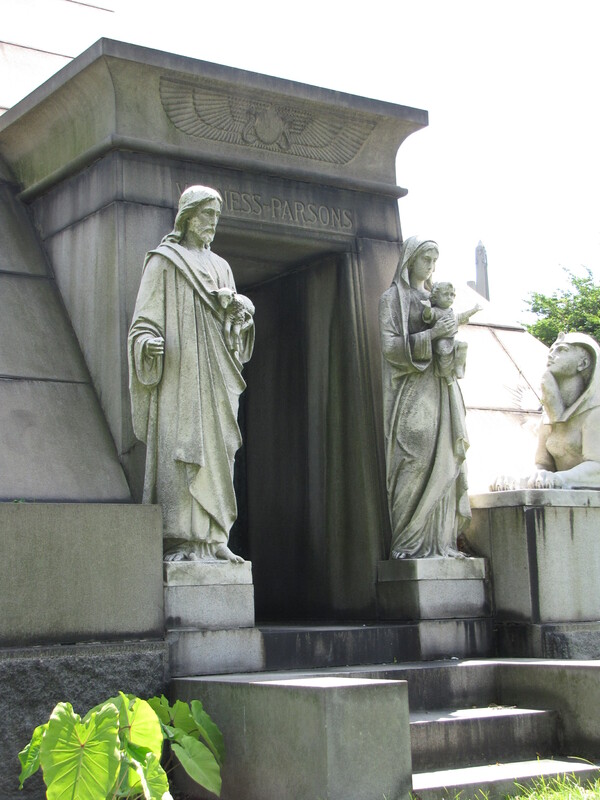 Nice examination of Egyptian revivalism in the Greenwood Cemetery. Always a pleasure to read your blogs. I hope you’ll hang in there for 500 more! Thanks for reading my blog. If you have ideas about things you’d like to read about, please let me know.